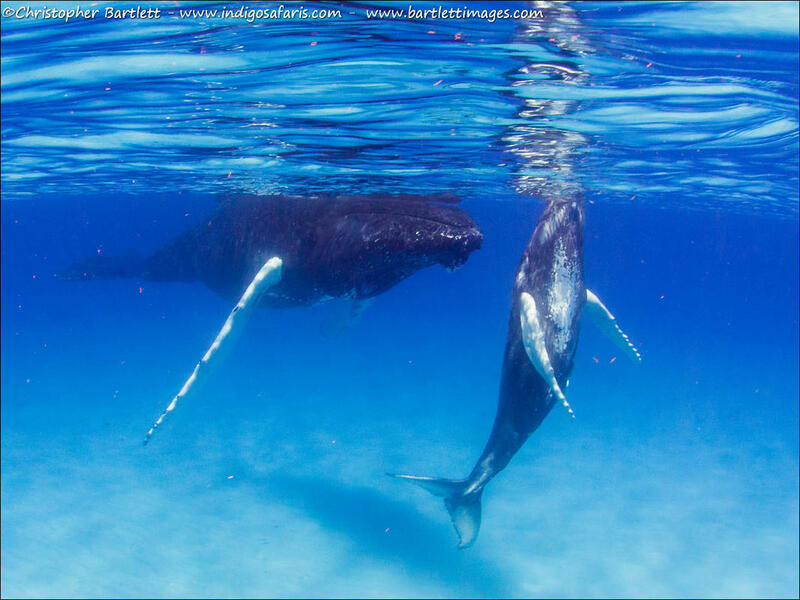 Every year, after spending the winter gorging in the plankton-rich waters in the northern Atlantic and Arctic waters, pregnant female humpback whales migrate to the warm, shallow waters of the and Silver Banks in the Dominican Republic and Salt Cay in the Turks and Caicos. Typically originating from the vast waters surrounding north-western Europe, Greenland, Iceland, Canada and from inside the Arctic Circle, the majority of whales head for a relatively small region near the Turks and Caicos and Dominican Republic. The attraction of this region are a few shallow banks, a perfect spot to give birth and teach their calves to breathe and swim the long swim down to the Caribbean to give birth and to mate. 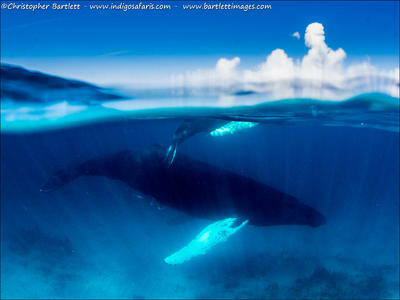 The females and their calves, and male escorts, can be found very close to the tiny island of Salt Cay. An estimated 3,000–5,000 humpback whales pass through these waters, making it the largest breeding and calving grounds in the world. The Turks and Caicos Islands are situated on a plateau that rises abruptly 10,000 feet (3048 metre) from the ocean floor. This plateau is partially split by the 6,000 foot (1830 metre) deep Turks Islands Passage which separates the Turks Islands from the Caicos Islands. 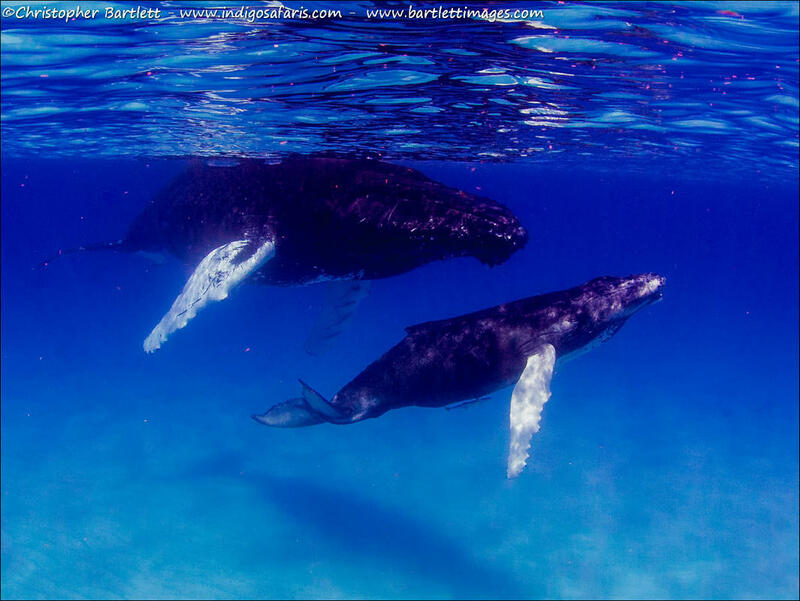 Whales are naturally funnelled through this channel, and the naturally increased density of whales make Salt Cay and Grand Turk unrivalled sites for whale watching. Once home to the finest salt marshes in the world, with a population of around 80 humans, a few dozen donkeys and one dive shop, Salt Cay is a great place to relax and unwind, staying in a charming Saltraker cottage or a seafront Salt Merchants’ house with a pool. This 6.7 sq km island is also a great place for bird watching and scuba diving. ​We have had some exceptional in-water encounters, with up to four whales at a time, a mother, calf, and two escorts. We go out with a knowledgeable guide on three and six-hour searches. When we find some relaxed whales, we gently slip into the clear, warm water and observe them for as long as they are comfortable with. In-water encounters can last from two minutes to an hour, depending on the whales’ behaviour. Once one encounter is over, we look for the next one. 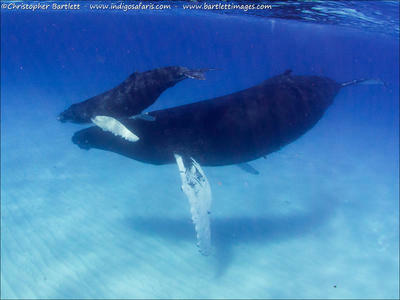 5 days of whale watching and snorkelling (6 hours per day), free daily yoga, photography coaching. Freediving is not permitted in the presence of the whales. A five-minute bike ride from the dive centre and restaurant (bikes provided) and beaches, Charming House has three double bedrooms, one with a large balcony upstairs, two on the ground floor with a large patio. The house has two bathrooms. There is also a fully-equipped kitchen, dining room, lounge and garden.Two minutes from East beach, five minutes from South beach, and two-minutes from Patrianna's and Miss Pat's. Opposite Charming House, a couple of minutes from East beach, this two-bedroom, one-bathroom ground floor cottage has a large garden, shaded patio, and raised viewing deck with sea views in all directions. a 5-minute bike ride to the dive shop, and only 2 minute's walk from Patrianna's bar and Miss Pat's restaurant. Seaside Cottages sits directly on the ocean and is comprised of a main house and two cottages located on the beautiful old Morgan Estate in the South District of Salt Cay. The Morgan Estate was built in the 1850s and is one of the oldest settlements still standing on Salt Cay. The property sits facing west and boasts a splendid sunset over the ocean. There is direct beach access use of two ocean kayaks which can be launched directly from the house beach. There is snorkeling right from the beach off the back of the house. There are also two teak beach lounge chairs positioned to take advantage of the beautiful oceanfront view as well as four bikes, an outdoor shower and a wonderful hammock for use by guests. The main house made up of a living room with a 32" flat screen TV with DVD player, a fully equipped kitchen, a large bedroom with queen size bed and a large bathroom with a shower. The back of the house opens up to a large outside patio perfect for viewing the sunset and having a cocktail at the end of the day. Conch Cottage is a brand new villa built in 2014 and one of the only vacation rentals on Salt Cay to offer air conditioning. Relax in comfort with a pillow top queen size bed, a large modern bathroom and a 32" flat screen TV with DVD player. Make breakfast and a pot of coffee before heading out for a day of snorkeling, diving or whale watching. The kitchenette is fully equipped with hot plate, coffee maker, microwave, toaster and silverware, plates and all cooking utensils. Coral Cottage is the closest villa to the ocean and boasts a spectacular view out its west facing window. The villa was updated in 2014 with addition of a large modern bathroom, fully equipped kitchenette and a front patio. Found in Balfour Town and close to Deane’s Dock, the oceanfront Tradewinds offers guest suites with kitchenettes and en-suite bathrooms. The dive centre and restaurant is a short walk away. Bicycles are provided for island exploration. Located in central Balfour Town and not far from Deane’s Dock, one-bedroom cabanas with a pool and Wi-Fi. Each room has a queen-sized bed and ceiling fan, looking onto the ocean. The Vistas Upstairs has a deck overlooking the ocean and is an open floor plan with fully equipped kitchen, living room bedroom and bath. Television with built in CD player to watch movies or listen to music.. It also has an exceptional deck for whale watching, enjoying the sunsets or just relaxing.. Vistas is right on the beach, three minutes' bike ride at from the dive shop and Ocean Air, four minutes to Patrianna's and Miss Pat's. With a king bedroom and bathroom upstairs and a queen bedroom and twin bedroom downstairs, Third Estate also has a good-sized living room and large eat in kitchen. Includes: Domestic flights, accommodation, snorkeling, photography tuition, island tour, breakfast in Providenciales. Does not include: Meals, snorkel equipment rental. On Salt Cay there is a good beachfront restaurant next to the dive centre for breakfasts and lunches, and we arrange a BBQ dinner one evening here too, for $25. Just behind the dive shop is a very nice restaurant called Ocean Air. Close to Charming House, Last Resort, Seaside Cottages, and Third Estate is Patrianna's Bar, and Miss Pat's restaraunt. Charming House, Last Resort, Third Estate, Vistas, and Tradewinds have kitchens, and Seaside Cottages' Conch Cottage and Coral Cottage and The Cabanas have kitchenettes, and there are a couple of small grocery stores where basics can be purchased, and fish can be bought from the local fishermen. 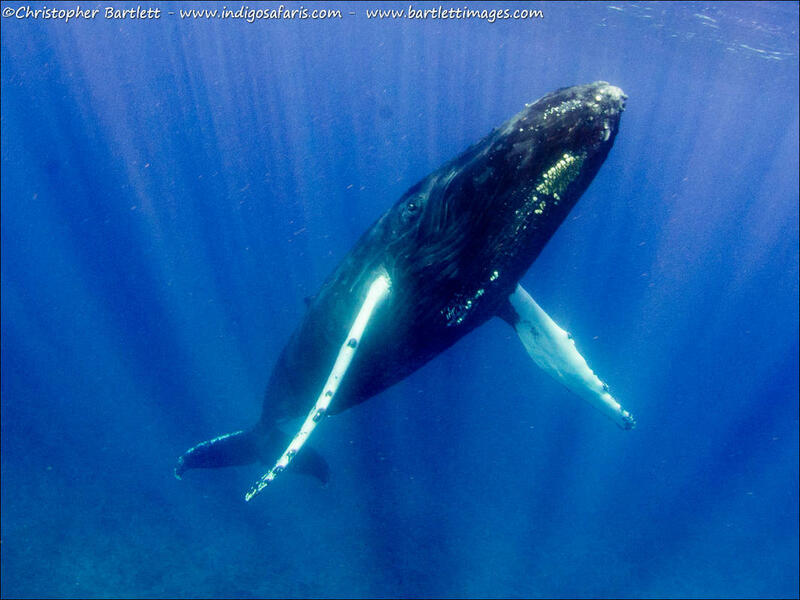 Provided by Indigo Safaris’ founder and underwater photographer Christopher Bartlett. Christopher’s work has been published round the world, and over the last decade he has had more than 100 articles published on a range of diving and marine conservation subjects, and to date has a dozen dive magazine cover shots to his name.